In addition to the charm of natural beauty and cool atmosphere. Bandung is also famous for its culture and art works are quite popular in Indonesia. Native Sundanese culture in Bandung is still maintained and preserved by some people in the city by opening several places art to be missed. Here are some interesting places in Bandung is famous for its arts and culture. Saung Angklung Mang Padasuka Udjo located in Bandung. The cool atmosphere and beautiful countryside are felt here. Participants will be invited to make angklung with Half Day program. Travelers will be given an explanation and see how to make the start of the search tone angklung, bamboo cutting, until the varnish. Once completed, the angklung can be taken to home as a souvenir. After that, visitors will be invited to watch the angklung performances which are held every day. Angklung performance begins with a puppet show demonstration for 15 minutes. The opening performance only briefly, because the puppet show actually takes about seven hours. The show’s opening with Indonesian tradisional musical accompaniment like angklung, gamelan, howl, and gongs. The next performances are lumping horse dance by children and wedding procession circumcision. This show is very attractive and festive. Angklung players is also not only children. The song that is played not only traditional songs, but also some pop songs can be played. Travelers will be invited to come play angklung at the same time. The show followed by dancing together. 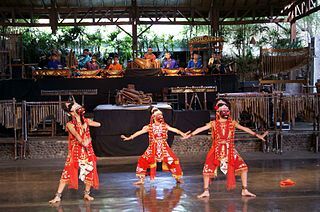 This closing attraction will invite visitors to sing and dance with the angklung players. Although only briefly, travelers will be reluctant to leave this place. strains farewell song will leave a sense of longing for the visitors. Bandung Geology Museum has deviant collection of objects relating to the earth. Ancient buffalo, replica T-Rex, ancient human skull, until the various stones that make up the this planet. about 250000 mineral rock collection and 60000 fossil collections was stored safely in this place. This building is used by the previous Bandung Geology Museum from laboratory. Bandung Geology Museum was inaugurated in 1929. When it went into the Indonesia Geology, tourists will be presented with an overview of the nebular hypothesis, a map of the distribution of craters and meteorites, the oldest stone sample, procedures for geological research, as well as an overview of mock volcanoes in Indonesia. Space is the life history of the most interesting places. The life cycle of a primitive to modern humans, flora and fauna Bandung ancient, prehistoric life in Bandung, as well as a complete overview of the history of lake Bandung also exhibited in this room. besides, there are framework of largest dinosaur and most vicious carnivores, T-Rex Osborn with a 6.4 meter high towering in this room. some of the original fossil was also exhibited in the museum is like a skeleton fossils of ancient animals in Java, homo erectus, stegodons, ancient elephants, and petrified wood fossils. Moving on to the second floor, visitors can learn about oil drilling and mining through mockups on display. Auditorium of the museum is also often play a movie on the geology produced by the museum. Part of a collection of various types of rocks and minerals in the museum also sold as souvenirs. The museum collection can also be taken as a personal collection of travelers. Sindang Seret 2 restaurants located in the area Cikole, Lembang. Just before the mountain of Tangkuban Perahu. Adventure land provided by this restaurant are include riding rides around the garden, flying fox, high ropes, air soft gun, ATV Track Arena, and paint ball field. For starters, you can try the mini ATV is located near the entrance. ATV Arena is suitable for beginners, but it is quite exciting and challenging because it has a lot of bends, climbs, off-road and track use. If you are already familiar and proficient with the ATV track field, you can try a wider track level. You can also get around the area with a wide Sindang Reret 6, 5 acres using ATV. In addition to trying a variety of games, you can also do agro tourism. Strawberry field here is very tempting to visit and red fruit ready to be plucked. As with other Lembang area, Sindang Seret also provide rabbit farms. You could feed a rabbit or it could be to buy a cute bunny that is provided in this place. Additionally, paint ball arena and air soft gun can also be played if traveled with friends and family. Vacation with children and families to the duo did not complete it if not been to Yosemite this traffic park. children can play while learning about traffic, highway replica, cars and mini train will meet this park. The park will invite visitors to recognize the traffic rules on the road. Once inside, visitors can learn about the various traffic signs. Enough to rent a car battery or a mini bike, children can perform driving simulations on the highway to pass through the tunnel. Various signs and road markings will accompany the exploration of their highways. If there is a mini train that passes, the barrier will close the access road towards the railway tracks. Traffic lights are also provided so that accidents can be avoided. Replica road is also equipped with a mini electric pole like a real highway. In addition, children may exacerbate glide between trees using the flying fox. Like the other city parks, this place is also equipped playground and park reading to improve children’s interest in reading.